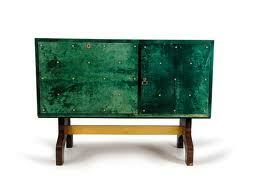 Aldo Tura was an Italian artist-craftsman who started to manufacture and design furniture in the 1930’s. As an experimental furniture designer Aldo Tura often used a wide selection of unusual materials which included: eggshell, parchment, leather and wood veneering. Aldo Tura’s works are often praised for their quality of craftsmanship which can be attributed to the limited series production, sometimes limited to only the prototype. Aldo Tura’s furniture can be recognized for its distinct and unmistakable use of leather (often goat skin), bronze detail and the use of strong use of red, green, and yellow. Following the art deco movement that put focus on straight lines and angles, Tura’s designs were innovative for their use of flowing lines and freer shapes. Tura’s works took on a different look in the 50’s when he started producing hand painted sitting room furniture with architectural or Venetian landscapes.